When the time comes, daily routine wins over everyone. We want to sit back and have have fun with our friends in the end of the week. However, there ofthen are thousands of miles between us, or lack of mood. 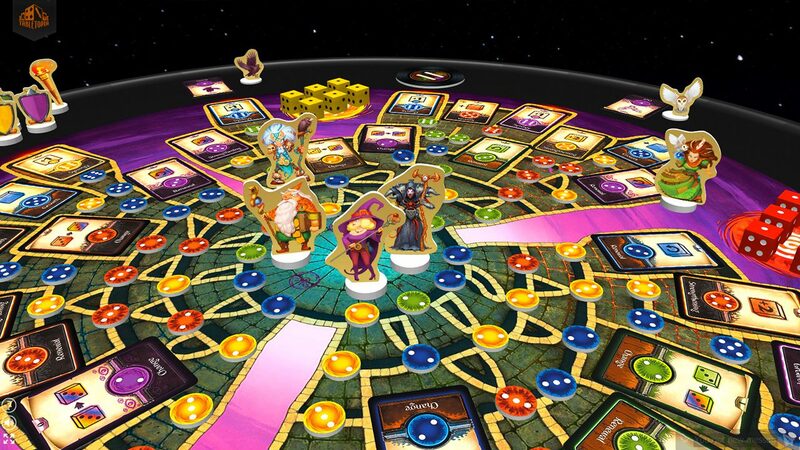 But it’s no obstacle for Tabletopia, which is a free-to-play virtual boardgame table. The idea is to create a space to play uncountacble number of such games. You can play on both PC or a tablet. And the process itself is as close to the reality, as it can be. As a vital bonus, you can also get comfortable on the sofa with food and drinks. User interface looks good. Dark blue background in the main menu doesn’t give you any eye problems. 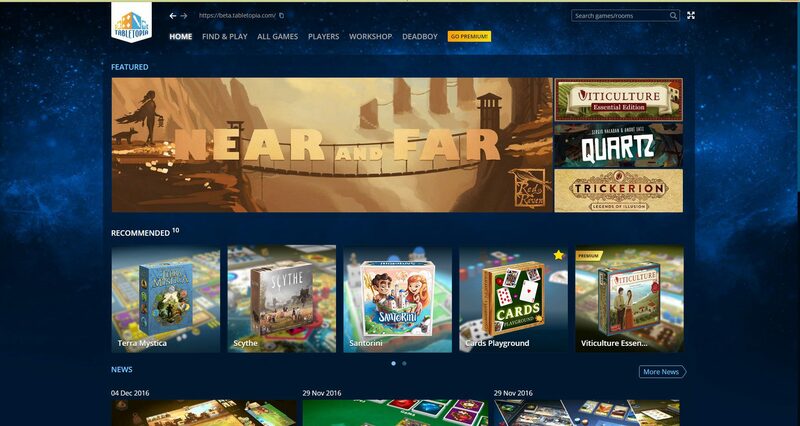 The home page suggests to get acquainted with “recommended” games. Why these exact games are recommended is a mystery for us, although, there definately are some good examples. Further comes the “popular” section. Most of players here a rookies in boardgames. It’s quite hard to define a worthy game these days, so this section is useful to see which of these games are played most. ALL GAMES section gives us every single game available. At this time, there already are 354 of them. In addition, there is a filter, so you won’t have to break your brain and eyes, looking for a certain time-waster. Well, a problem for some of us may be the lack of localization, though it’s all right for you, if you’re reading this, right? Playing with friends is cool. It’s easier to learn the rules and, in general, friends are certainly more fun in this case. Just choose the game, invite friends and go ahead. But in case if you want to play a game for 7 people, but there are only 2 of you, worry not. 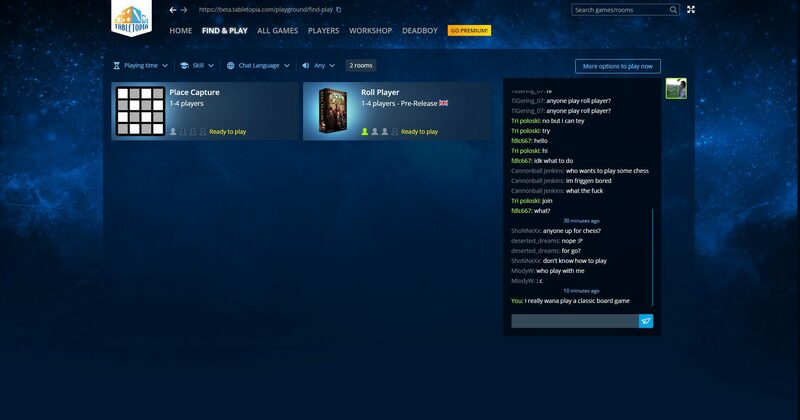 Create a lobby and wait. Any willing one can join through FIND & PLAY. And it works for you too. Find new comrades – don’t be shy. The game has got both usual text and less common voice chats. Для разработчиков игр создана отличная система для творчества — WORKSHOP. Изначально доступны уже многие компоненты (карточки, токены и т.д.) Создавайте свои прототипы, оформляйте, скидывайте ссылку друзьям, тестируйте и если, на ваш взгляд, все хорошо — можете презентовать на Tabletopia издателю. Как говорит разработчик Tabletopia и люди, которые создают настольные игры, это очень удобно, можно перескочить множество суматохи (смастерить игру, привезти издателю и т.д.). 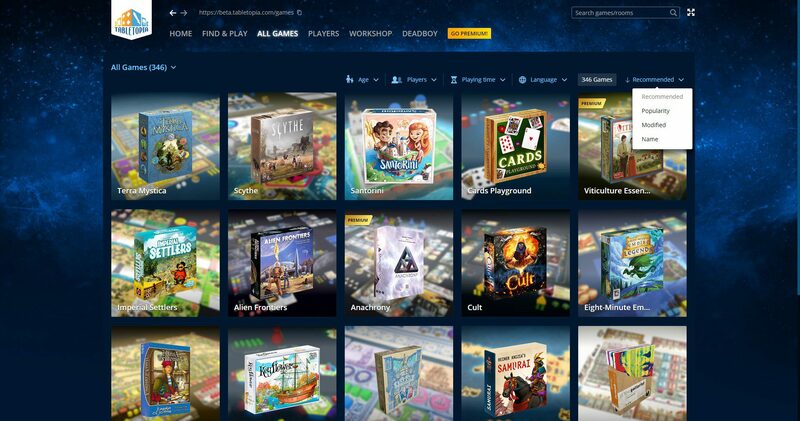 В Tabletopia можно купить премиум аккаунт, который дает доступ для платного каталога игр. In general, the game is good. It keeps developing, maps keep being added and improved. 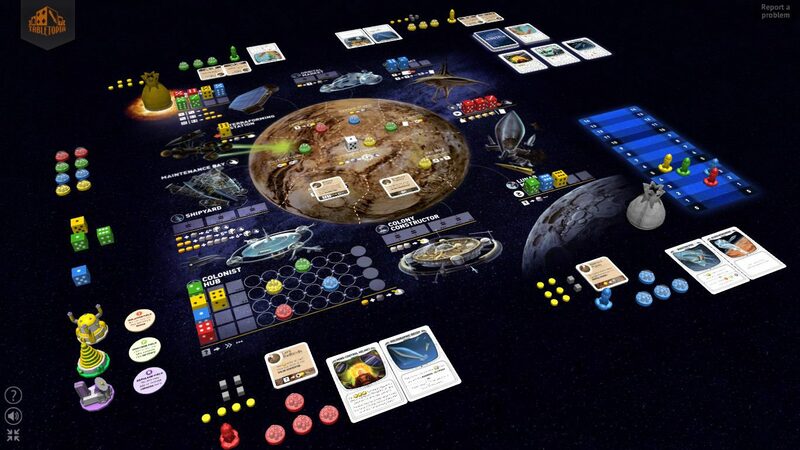 No, it’s not a Tabletop Simulator yet, but it’s very good for a free-to-play project. Those, who are willing to get familliar with boardgames are welcome here.